This easy-to-use recycling program provides a complete waste collection, shipment, and recycling solution for used disposable gloves, including plastic, nitrile, vinyl, and latex gloves. The plastic waste is ground, melted, and pelletized through extrusion by TerraCycle® to create recycled resin. That resin is then combined with other recycled plastics to make eco-friendly products. Place boxes in convenient locations in any lab. When full, simply add the collection box to outgoing mail. Each box has a pre-paid UPS shipping label affixed. 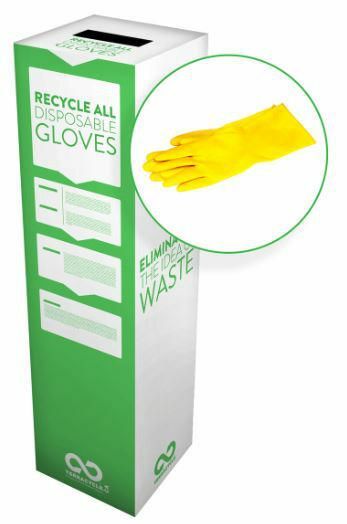 This program offers a convenient opportunity to recycle an abundant source of waste found in most labs, divert hard-to-recycle plastic from the waste stream, and give waste new life. Please do not include hair nets, ear plugs, and/or lab coats and garments. Also not accepted: household hazardous waste, any item classified as sharps, flammable, reactive, corrosive, ignitable, radioactive, toxic, infectious, or pathogenic. Ordering information: Each sturdy collection box is made of double-corrugated cardboard and comes with simple assembly instructions.